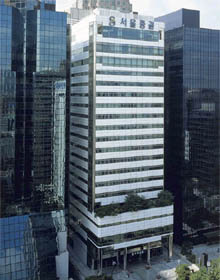 Seoul Securities building in downtown Seoul. The building and commercial property of South Korea's major securities trading group was recently acquired by a German fund management company Deka Immobilien. Frankfurt — Deka Immobilien is continuing its internationalization strategy by expanding its Asia portfolio with its first investment in South Korea. For the equivalent of €68 million (83,694,367 US dollars), it has acquired an office and commercial property from securities trading group Seoul Securities. The property will be part of Deka-ImmobilienGlobal and lifts the Asia-Pacific share of the open-ended property funds portfolio to 23.5 percent. At the same time, Deka Immobilien a property investment fund company belonging to the German Savings Banks Financial Group has increased the number of countries in which it owns properties to 18. The Seoul Securities Building is located in the eastern part of Yeouido, one of the citys three main districts. A Class A property, it has over 40,440 square meters of office and retail space and is completely leased. The office property market in this district has stable rental growth and very low vacancy rates. In 2003, the vacancy rate was 3.9 percent, and rates of 4.0 percent for 2004 and 3.0 percent for 2005 are expected. At around 5.6 million square meters, this major metropolis with 10 million inhabitants has a very small supply of Class A office space in the city's main districts. The South Korean property market was not opened up to foreign investors until the late 1990s. Since then, it has increasingly attracted the interest of international investors and now exhibits a high level of liquidity. The country's economic indicators also underscore the choice of Seoul. Along with China, South Korea is one of Asia's fastest-growing economies and this trend is expected to continue in the years ahead. DekaBanks economics department anticipates that South Koreas gross domestic product will grow by 5.3 percent this year and by 4.9 percent in 2005. Deka Immobilien is Germanys largest provider of open-ended property funds. It manages total assets of around �19 billion in three mutual funds and eight property funds for institutional investors. These funds are invested in 353 properties in 18 countries on four continents.